but CBD is what we want and not THC… CBD has a broader spectrum of healing propreties. While it is true that CBD has a broader spectrum of healing properties, as I discussed in an earlier blog (https://wellsuitedforlife.com/2013/11/14/cannabinoid-profile-cbd/), THC does have numerous medicinal benefits as well and many of them overlap with CBDs. It is presumptive to assume that everyone wants the same cannabinoids, to that end this recipe works just as well for CBD but you need to use a slightly lower temperature to not decarboxylate the CBD. Also make sure you are actually using CBD rich cannabis, most is not and I wouldn’t trust it without lab results to prove it. Thanks so much for the comment, great point about CBD, my apologies for overlooking it. Can you please let me know the amount of water you used in the process? And when you added how much? I used enough water to cover the cannabis then added more as needed. 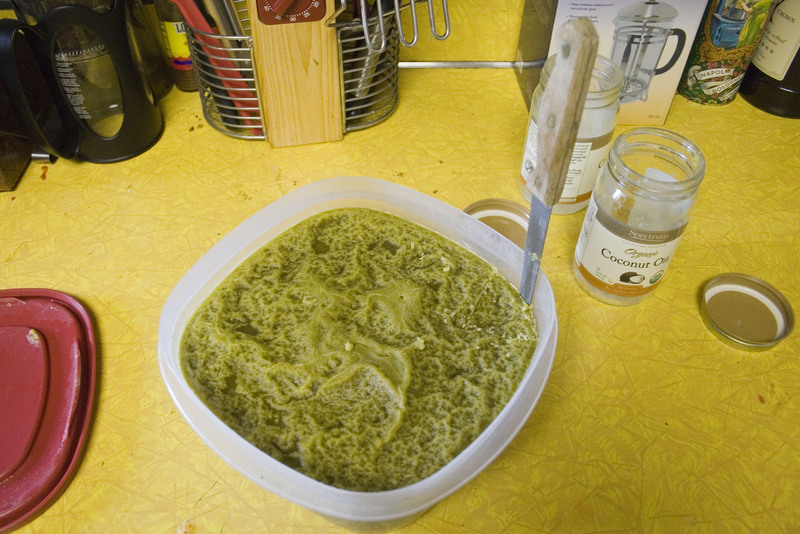 The goal is to use as little water as possible without burning the butter/oil/cannabis mixture. I’d say probably about a 1/2 ratio of cannabis to water, maybe a bit less than two parts water for each part cannabis. If water does not bind to the active ingredients, & there is nothing beneficial in the tannins (?? I don’t know this, but inferring based on your post- I’m a newbie to making anything myself), why does using as little water as possible matter..? I’ve read other posts that said in crock pot method to just pour water to top bc u just pour it off after refrigeration. My main goal is finding the most potent, least wasteful bang for my buck. Isn’t an oz at least $200? So I don’t understand all these posts in forums (other sites) that seem really non-chalant about wasting that amount on an experiment gone wrong.. Maybe I’m missing something? Also, why must the plant matter be strained out, just for flavor? My thinking was I’d drink the nasty water if it had anything beneficial in it, utilize the plant matter, whatever’s least wasteful, as I don’t care about my medicine being tasty as much as I care about it being potent & as inexpensive as it can be. Any thoughts from someone more experienced would be appreciated! Thanks & take care. You don’t HAVE to use as little water as possible, but since ultimately it will be going into plastic tupperware to chill in the fridge you have an incentive to create as little waste water as possible unless you have an industrial sized fridge. Crock pot would work fine and is very efficient for this but I don’t own one and have never tried that method. An ounce of medium quality bud sells for around $200 at dispensaries in California, where I live, but you can get bud a lot cheaper than that and generally people just use trim/shake rather than bud. If you are using bud you can scale back the amount of plant material that is going into the mix because bud is much more potent than trim. You can also boost it with hash if you want it to be really potent; in fact you could just dissolve hash into an oil and spare the entire process of using bud and dealing with that plant garbage and waste water at the end. The plant matter doesn’t need to be strained out but it has an awful texture for eating and it brings *nothing* to the table at this point, because all the worthwhile parts have been cooked out into your butter/oil. I have had hippie brownies where there were stems and leaves in the brownies; I didn’t care how strong they might be they were not edible. Do not drink the water unless you intend to induce vomiting. I tried to lick the spoon I used to scoop the butter once, it had some of the nasty plant garbage/water on it, and it was one of the worst tastes ever (on par with mescaline). Glad you like it, hope it works out for you as well as it has for me. A question really. 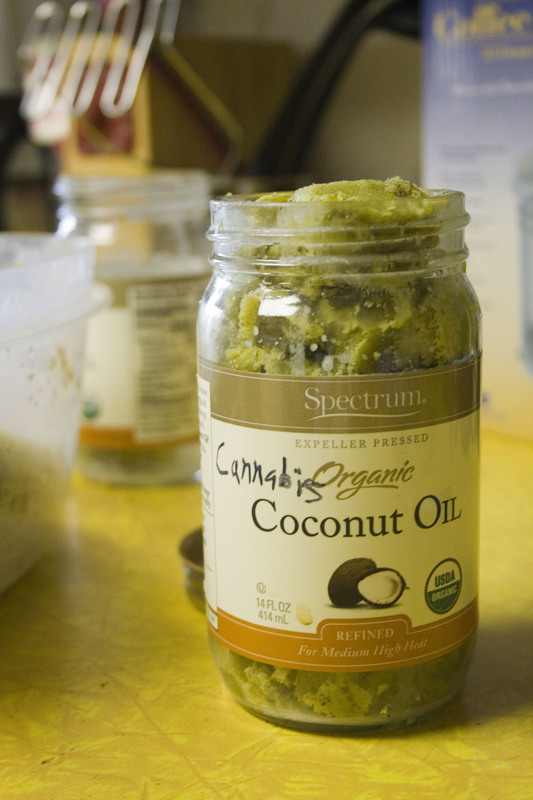 What’s the shelf life for the cannabis infused coconut oil? I’ve kept a batch of olive oil around for nearly a year, at that point it had gone bad, yet at about 6 months it was fine. I would say 6 months based off past experiences. Also, worth noting, when it goes bad it doesn’t become unusable but the THC has broken down into a new cannabinoid with the progression of time. If THC sits around for too long it becomes CBN, cannabinol. Have you attempted to use the 1/2oz of bud version of this recipe instead of the shake? What was the potency for the batch? Without doing actual testing for the cannabinoids which is expensive I cannot confirm the potency in any meaningful way, all I can say is it was a strong batch by my standards as a person with high tolerance. I have not attempted it with using only bud, it should factor out to be the same potency (less of a more potent product versus more of a less potent product). Do you cook the weed/water/oil mixture for 2-3 hours total or 4-6? I’ve done anywhere between 2-6 hours with different batches. The time, past two hours, doesn’t seem to do much though more cooking will potentially mean a better infusion. Be careful not to turn the heat up too much and cook off useful cannabinoids and terpenoids. I’ll come clean your kitchen for a spoonful of that! I’ll come clean your kitchen for a spoonful of that. While I appreciate everything Rick has done for the movement, I am wary to refer people to his oil. Everything I have read about it says he does not use all food-grade components, making his productive of a questionable safety for human consumption. The same oil can be made and is made without turpentine, but based off my readings this is a component of Rick Simpson’s famous oil. Know your medicine, know what goes into it, and ideally make sure it is laboratory tested. They were quite pleasant and also very strong. It was a very good batch, the curry I made with it was bomb. How much water should be boiled before adding the oil? The shake that is put into the oven… if the shake is already air dried should i still put it into the oven? I boil the water, oil, and bud all together. 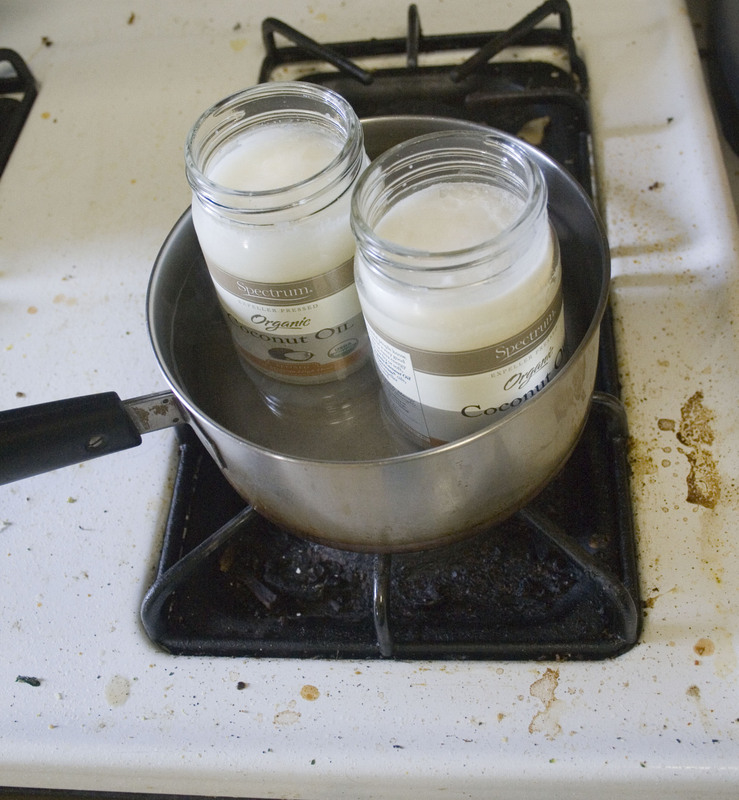 The goal is to use as little water as possible to cover the mixture of oil and bud to prevent it from burning. 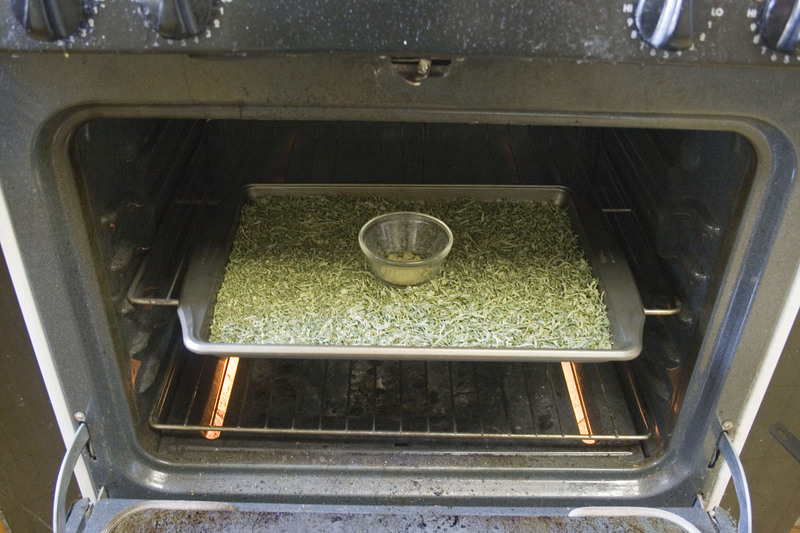 You should always put the trim/buds in the oven before making them into oil because that decarboxylates the THCa into THC and makes it more potent. Seems like you have double decarb going on here. Heating the pot in the oil also decarbs it. The oven decarb should not be necessary. They make a compelling case that a slight pre-cook in the oven at low heat will flash decarb some of the remaining THCa into THC, slightly upping your THC percentage. I do not always do that, as it is an extra step. Having done it both ways I feel it is worth doing the oven decarb before stovetopping it. I’m changing my mind. Here are some graphs showing decarb at different temperatures and time. http://skunkpharmresearch.com/decarboxylation/. The lower temp of an infusion does not yield the same good results as an oven decarb. So I’m now onboard with your oven decarb step. On a separate subject, I’d like to see some discussion on the horrible taste of infusions and tinctures. That really ruins it for me. Every edible I’ve ever made has a bad undertaste. Your explanation and process seems easy enough to follow. I’m interesting in making some thca/ and not decarbed for my 6 month puppy with severe epilepsy. He’s on such a strong does of antiseizure meds, and that means he will likely suffer kidney/ liver failure, as well as having a tolerance built up sooner. Most epileptic k9s don’t have seizures til 1-2 years old. It seems as His epilepsy has caused some severe anxiety in him, which causes him to whine, pace, freak out about 18 hours every day. I wish I could give him the full cannabutter treatment but there is not enough info on helping vs harming seizures and anxiety in k9s. I’m sure the thca/cbd Will help. Does anyone here have any suggestions on how to know if my dog creation has a medicinal amount of thca/cbd without being dangerous? Or How to go about making it safely? I meant DIY concoction not dog creation above. If I am understanding your question you want advice on making a THCa oil, in which case you wouldn’t want to use this method at all. Using any amount of heat will convert your THCa into THC, you want to use a cold-process like juicing fresh cannabis leaves. You could also try mixing fresh or cured CBD-rich bud in with your dog’s food. In regards to the safety I recommend you check out the cannabinoid profile series I have on here which include lethal doses for humans and animals. That should give you some idea of dosing, or at least what a lethal dose would be (they are quite high compared to other common substances like nicotine, opiates, or alcohol). I’m new to all this, but just reading up on alcohol based tinctures for cannabis… I already have made tinctures/extracts easily using highest proof alcohol like everclear or even vodka for herbal tinctures- or vanilla extract just by soaking bean in alcohol for a few weeks. From what I understand with weed u can use no heat, just infuse in the everclear (which my non-expert self hypthesizes would be higher in thca). Then u can add a little bit of honey to make palatable & minimize the burn of the high alcohol content & apply drops directly to tongue for sublingual effect (bypassing digestive process) or add to food or water- which will be digested so takes a bit longer to take effect. When I made an everclear tincture I was 21 years old and my interest was more in the recreational experience than making a medicinal tincture. I soaked bud and sticks in everclear for a couple weeks, shaking it regularly to help move things around. It’s a pretty simple method but not the most efficient and the taste is pretty harsh. Honey could help this, as you suggest. Ok. I just followed your recipe. I squeezed it with a cheese cloth. I also put some plastic wrap around the cheese cloth to help ALL the oil go into the container. Even doing this I got a lot or residual oil left on the plastic wrap and some on my hands. There has to be another way of doing this so we don’t waste any of that precious oil. Some sort of unit that we can put the cannabis in and put it under pressure to squeeze out the oil. Is there anything like this that you know of??? I’m glad to hear the recipe is working for you. I would personally never use a plastic wrap around something hot I am planning to ingest due to the possibility of the plastic off-gassing some chemicals into what I am making. This is also why I use cast iron pans instead of non-stick. 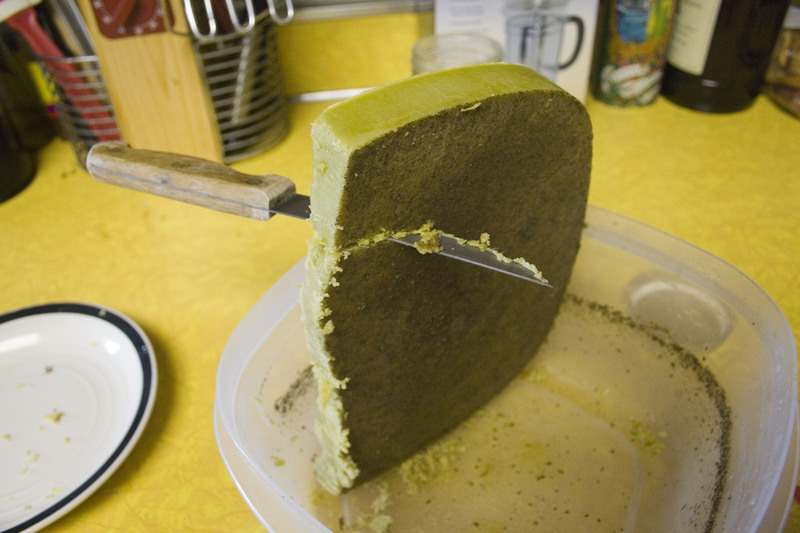 To answer your question, I just squeeze the heck out of the bundle of cheese cloth by hand and then use a spatula or something to lightly scrape the residue off my hands and into the bowl. I am sure there are numerous other ways to do it that are more efficient and high tech, possibly using some sort of food press re-purposed for this. I personally wouldn’t squeeze it too hard as you may burst the cheese cloth and get garbage plant matter into your oil. Im afraid we may have added too much coconut oil. We had an oz but I think it may have been a little short. Also my wife had added 8oz of coconut. When I tried it I was expecting some sorta high but it didn’t happen. we were thinking of getting another oz and being conservative with the coconut oil and combining the two. What are you thoughts? You have a strong incentive to make it as strong as possible the first time around because you can always cut it with something that is not medicated to weaken it. There really is no good way to raise the potency once it is made, applying any new heat to cook new cannabinoids into the mix runs the risk of cooking out everything you infused the first time around, or at least changing it in flavor/potency. I have never tried re-cooking medicated oil to raise the potency, it might work but my brain wants to say it shouldn’t; but again I haven’t tried it so what do I know? I would be interested to know the results, should you try it. I make infused coconut oil very similarly. One thing you can do with the oil if it isnt as potent as you want, is, use it as a rub. When your joints are tight and creaky, your muscles sore, minor muscle cramps, etc. The oil massaged on to problem areas does wonders. I do that all the time with the oils I make. It’s wonderful that it can work both topically and internally. 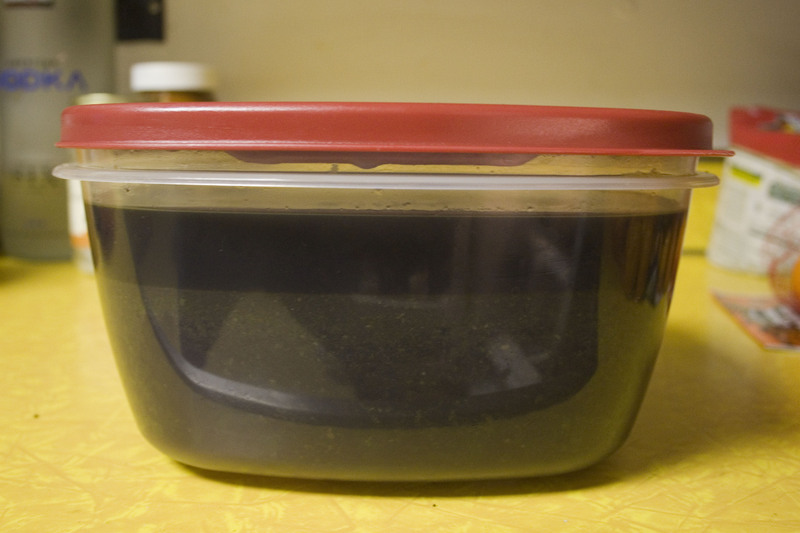 Hey, i started making the oil and it became dark right away, and the cannabis became somewhat crispy and very dark. It doesnt smell burnt but it definitely looks like its burning. I only used oil and cannabis (no water) and the oil wasnt even simmering that much, just occasional bubbles. Did I screw it up?! I have met some people who cook their oil without water, but you do run the risk of burning your oil. It sounds like you may definitely have burnt your oil and lowered the quality of your product. I would recommend adding water and trying to recook it with the water. 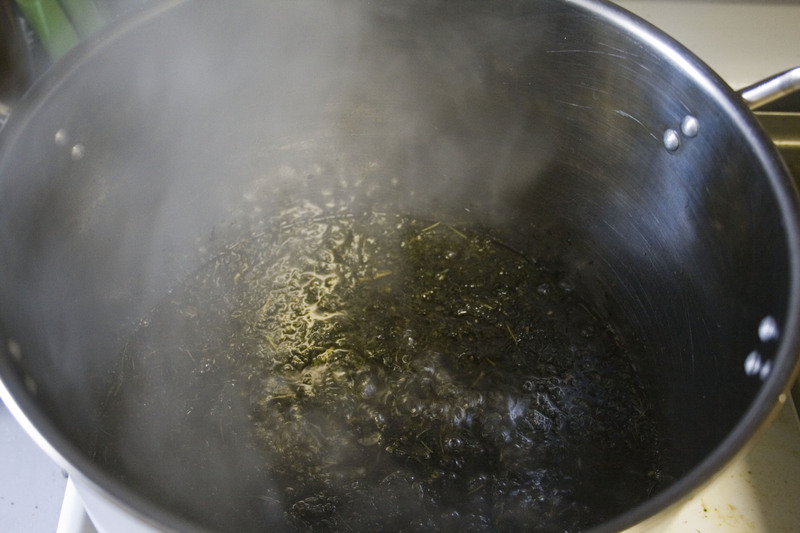 You really want to have the water in the mix, or if not, you need to use a double boiler with a layer of water in a larger pot around a smaller pot of oil and cannabis. What is the expected change in color and texture while the cannabis is cooking? very nice post. Congratulations on explaining the process so well. I still have a minor doubt. Where do you store the finished product? Refrigerator or pantry? I’m making mine with extra virgin olive oil. Where should I store it? I would store it like you do any other olive oil. I store mine in the pantry. I made coconut canna oil. I made so far canna dark chocolate covered energy balls made by me. And I put a little canna oil in my hot coco last night before bed and slept so good! The suff I made is potent!! I’ve never had that experience with any of the butter or oil I have made over the years, especially when stored in the fridge. Generally, from my experience, for butter/oil to mold it means there is some sort of impurity that is causing the growth. No. It is a very bad idea to vape anything containing MCT oil, as a journalist I have interviewed numerous doctors about the issue of lipid pneumonia, which is caused by vaping oils (lipids) into the lungs. Most docs advise against vaping MCT/coconut oil. This is for eating or topical use.